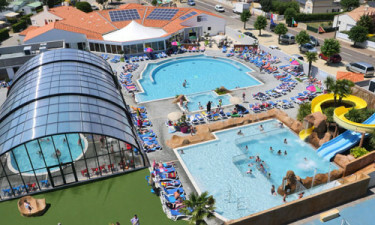 L'Oceano d'Or luxury camping site is strategically situated close to the dreamy harbour of Jard-sur-Mer, in the Vendee region on the Atlantic coast. The site enjoys the twin aspects of rolling countryside scenery on one side and a lively, seaside town on the other. This popular holiday resort offers an extensive range of luxury mobile home accommodation, all of which come fully equipped for today's modern family. To find out available dates or to book your mobile home, check in with LUX-camp today to get your vacation started. Welcome to L'Oceano d'Or luxury camping site. About L'Oceano d'Or luxury camping site. Why should I choose L'Oceano d'Or luxury camping? Exceptional pool facilities for all the family to enjoy. Gas and charcoal barbecues provided free of charge. A selection of great daytime activities and varied evening entertainment. Start your camping holiday at the site's superior swimming pool complex. The palatial pool is surrounded by swaying palm trees and decked out with sun loungers so you can soak up the holiday ambience. The water slides, plunge pool and water slides are guaranteed to entertain the kids for hours, so you can kick back and relax in the Mediterranean sunshine. 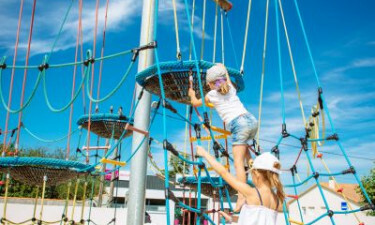 The complex is stylish and well laid out; there is a smaller pool for the younger ones to splash about in and a playground complete with swings, slides, climbing frame, roundabout and sand patch. In the games room, children have access to a pool table, table football and video games. There is plenty to do on the site, with a variety of organised activities and leisurely pursuits for adults as well as children. On the park grounds, you can expect to find a tennis court and two table-tennis tables. Ask the friendly helpful staff for racquets as they store them onsite. There is a basketball court complete with volleyball net, whereas if you fancy a spot of the traditional boules game, a pitch is provided. Families can participate in sports tournaments and competitions and there is regular, live entertainment including bingo and karaoke sessions. The site has all the modern conveniences a family needs to have for a special camping vacation. There are toilets, hot showers, baby baths and changing facilities, plus washing and drying machines. Irons are available on request, as is a laundry service. Wi-fi is available, as are bilingual, friendly staff who are only too happy to make your stay as comfortable and enjoyable as possible. If you tire of the site and fancy a change of scenery, the nearest beach is only a kilometre away. L'Oceano d'Or luxury camping holiday site has a small grocery store that stocks everything you might need from vegetables and fruit to traditional freshly baked French bread. 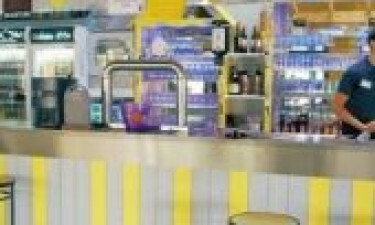 There is also a take-away service that provides typical dishes and a resident bar that serves refreshing drinks.